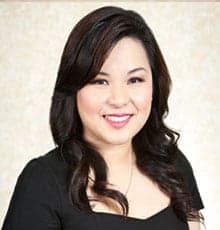 Dr. Marie Bui was born in New Orleans, La., and grew up in Port Arthur, Texas. She received her bachelor’s degree from The University of Texas at Austin and her master’s degree in biotechnology at the University of Texas at Dallas. She received her medical degree from The University of Texas Medical School at Houston. Dr. Bui completed an internal medicine internship at Brackenridge Hospital in Austin. She subsequently returned to the Texas Medical Center to complete her ophthalmology residency at the University of Texas Medical School at Houston, where she served as chief resident in ophthalmology. During her residency, she enjoyed educating her peers while achieving excellence in cataract and refractive surgery, medical retina and oculoplastic procedures, and was selected to receive the Outstanding Resident in Ophthalmology Award at the conclusion of her ophthalmology training. Taking a personal approach to each patient has always been the hallmark of Dr. Bui, who prides herself on spending time with patients to understand their needs. Her mission is to provide the best care, with the safest, most reliable and most innovative technology available. Her exceptional training and extensive experience have made her a strong surgeon, specializing in small incision cataract, glaucoma and refractive surgery. Dr. Bui is available for consultation and is experienced in a full spectrum of medical and surgical eye conditions, with special interest in cataract, all-laser custom iLASIK and minor oculoplastic procedures. In her free time, Dr. Bui enjoys trying out new restaurants, photography, scrapbooking and walking her adorable dachshund, Balki. If you are a patient of Dr. Marie Bui and would like to share your opinion, click here.